Note these are music moments on Scrubs, no editing has happened, just pure video from Scrubs. And here are the top 3 music moments from this great show. I’ll probably do a second version. Honorable Mention-Seperate Head and Body Karaoke. I didn’t know whether to classify this as a music moment. #3-This rather serious moment showcases The Fray’s How to Save a Life. #2-This one has NSync, Abba, and OK Go when J.D. ends up in Vegas. #1-This rendition of Boston by The Cool Cats made it’s way to #1. Does Size Not Matter Anymore? The great PSP title last year, Ratchet and Clank: Size Matters, which I really enjoyed, is now heading towards the PS2. In a show of love towards those Ratchet and Clank fans who don’t have PSPs, this great game will come to the PS2, I guess as the same version as the PSP version, only on the PS2. The remake will hit store shelves March 11, 2008. Super Smash Bros. Brawl-My Most Anticipated Game Ever? Nintendo Power-Rarely has any title delivered so much amazing action, such a wide variety of modes, and so many hours of value. It doesn’t get any better than this. Thunderbolt-Brawl is easily the most fun I’ve had on a Wii, and could be the most fun I’ve had with a game in ages. It’s just that good. There is just so much to do, and so many different and refreshing things added that it would be a crime not to at least take a look. Gameplayer-Brawl’s chaotic multiplayer sessions are some of the best to be had on the system, plus there are plenty of challenges and modes to amuse those ‘friend-impaired’ individuals out there as well. It’s a no-brainer, every serious Nintendo fan out there should score themselves a copy of this game, invite some friends/victims around, and have a smashing good time. Might I add all but one of the reviewers collected in the aggregate at Metacritic gave it a perfect 100. I am so looking forward to this game, an anticipation I don’t think I’ve ever felt for a game. I loved the 1st and 2nd to death, have even held onto a $50 Best Buy Gift Card I got for Christmas for Brawl! And if you know me, you know I have trouble holding onto money. Extremely positive reviews are coming in daily, and it is only killing me more and more. Our spring break is the week after the Sunday release of Brawl, and I know what I’ll be doing most of the time. I am so excited for this game, possibly the most excited I’ve ever been for a game. I’m gonna go play Melee for a while. Here are a few links to some reviews of the game. Here are the trailers for the upcoming movie where one man goes into Iraq to find Osama Bin Laden, the upcoming Get Smart movie, and the movie coming soon to DVD that also stars Steve Carrel, Dan in Real Life. One of my favorite older shows was Kenan and Kel, and here are some of their funniest moments. Several games have just been set for release for the 360 and PS3. Dead Space, the survival horror game set…..in space will be scaring stores this Halloween. NBA Ballers: Chosen One, the next installment in the Ballers franchise will be slam-dunking it on April 21st of this year. The more-than-anticipated Metal Gear Solid 4: Guns of the Patriots has been set by retailers to release June 12, optionally alongside the PS3 in a bundle that includes the new Dualshock 3 controller (it has rumble). The bundle will run for $500. The sci-fi shooter for Ubisoft Haze that was set for the gaming flood of 07 has been set for another release date, this time in May, more specifically, May 20th, 2008. 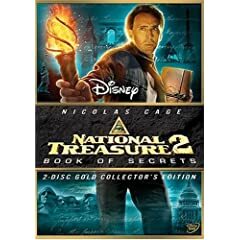 National Treasure 2 was confirmed for a May 20th 2008 release date here in North America, however, they have just now released the boxshot for one of my favorite movies last year. (See below) There will be a one and two disc version, with the one-disc just carrying a commentary with Turteltaub and Jon Voight, but the two disc will include that, deleted and extended scenes including “The Chase at Rushmore”, several behind-the-scenes featurettes, a Knights of the Golden Circle Documentary, Bloopers, and more. I am definitely looking forward to it, both me and my dad liked it, so we’ll probably be picking it up. The left is the 2-disc, the right is the single. This is a comedian I find very funny, his name is Jay London. He’s one of those you either get or you don’t. He was a runner-up in the second season of Last Comic Standing. DS and James, you guys can blame him for all of my lame jokes. The PSP will be getting a new color scheme in the coming months. A red PSP designed after the hit series “God of War” will be released alongside the new PSP/God of War installment, Chains of Olympus on March 4th, however, a bundle pack running for $200 will come with the red PSP, a copy of Chains of Olympus, a UMD of Superbad, and a voucher for a free download of Syphon Filter: Combat Ops onto your memory stick. These are just a collection of great Youtube videos I found. The man’s name is Irving Fields, he’s 92 and he has made a wonderful, surprisingly catchy theme song for Youtube.com. Congrats, it will be stuck in your head for days. The next clip is Under the Tusken Sun, a wonderful love story in the land of Star Wars. The final is a proposal gone horribly wrong at a basketball game. It has been confirmed that Monk, Psych, Burn Notice, The Starter Wife, Law and Order Criminal Intent will be renewed for the summer season, and the new show In Plain Sight will also be coming in then. This will be the 7th Season for Monk, the 3rd for Psych, the 2nd for Burn Notice, the beginning after the miniseries of The Starter Wife, and the 270th Season of Law and Order. However, all news was not good. It was said by Variety that this new season of Monk will likely be it’s last, which brings a tear to my eye (not joking, seriously, I promise). Monk has always been a great show that I could rely on to make my Friday nights great and to cheer me up on DVD. I really hope this isn’t the end of Monk, but if it is, they better do it right. It is said that the final season could focus on the wrapping up of the Trudy Crime and Monk being reinstated after saving the Governor’s life. The season concluded with an all together satisfying and awesome…conclusion. The second half of the story began with Monk meeting Stottlemeyer on the beach after their planned killing so that Monk could investigate away from Sherriff Rollins. Stottlemeyer’s the only one who knows, so tensions run high with Natalie and Randy working on his funeral. There was a really nice reference to Sherona when Natalie was making the arrangements, but I wish she would have shown up and that they would have done a funeral scene, but I’ll live. Natalie blames the captain for unneccesarily killing Monk, and calls him a murderer. 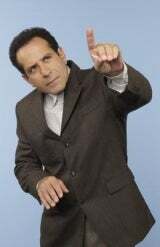 Meanwhile, Monk is in Nevada, where he takes the name LELAND Rodrigeuz and works at a car cleaner, where he is yelled at for hillariously “cleaning the inside of a cigarette lighter”. He lives in, despite his wishes, at a compartment complex in #9, and accidentally solves a case, bringing Natalie’s attention to the name Leland. 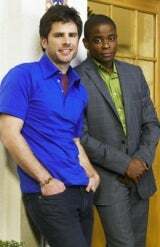 Rollins searches constantly for Monk’s body, and follows his boss’ orders to follow Natalie and make sure Monk is dead. Natalie and Monk have a very funny reunion, and brush with Rollins. They steal his car, and find out some more info on him. They discover he had been receiving $10000 dollar checks from an organization traced to a person I had been suspicious of, Dale “The Whale” Biederbeck, unfortunately not played by Tim Curry. They also find plans to kill the Governor. Here’s what happened: Dale was always jealous of Adrian, and he wanted to trade places with him. He hired Rollins and Mr. 6 Finger to come in for his dastardly plan. He wanted out of jail, and bribed the lieutenant governor to help him out if he got rid of the governor. He hired the 6-finger man to build a bomb, and got Rollins to take him out and make it look like Monk did it. That way Dale would be out and Monk would be in. They figured it out and saved the mayor just in time. But that’s not all for those of you who say “But I thought there would be Trudy Development!” While searching the 6-fingered man’s house, they found a name, The Judge. Looks like Monk will be back for a 7th Season! After a Weekend trip to the Smoky Mountains, I am back. I enjoyed my trip a lot, especially my conference for Christian Youth. There were several great moments, especially getting to see the upside-down house. I got to stay up until 1 o’clock in the morning in order to watch Monk (I was going to see how it ended. New Monk beats sleep, every time.) I even got to see cops chase down criminals outside of a TGI Fridays. I enjoyed my trip and I am glad to be back. I’m leaving tomorrow morning for a conference in the mountains, so I won’t be posting until probably Monday afternoon. So, I thought I would leave you something to keep you entertained during my absence. Enjoy. Did you really expect anything else from me, your good ol’ pal Earl?